Click this link for Questions & Homework on momentum. Click – Momentum Questions & Homework Answers. The momentum (p) of an object is found by multiplying the objects mass (m) in kilograms (kg) by it’s velocity in metres per second (ms-1). 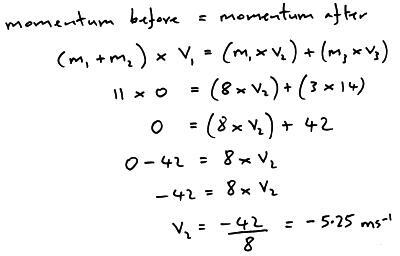 Momentum is a vector and it’s unit is the kilogram metre per second (kgms-1). Example; A car of mass 2000 kg is travelling at 32 ms-1. What is its momentum? Newton’s Second Law – link to Newton’s laws. The rate of change of momentum of an object is directly proportional to the resultant force applied and is in the direction of the resultant force. The resultant force is equal to the rate of change of momentum. If we multiply the force acting on an object by the time it is acting for this is called the impulse of a force. Impulse is a vector and its unit is the kilogram metre per second (kgms-1) or the newton second (Ns). So we can see that impulse is equal to the change in momentum. In the video below the tennis player follows through with her swing to increase the time she is on contact with the ball, this gives the ball a greater change in momentum. In the video below the stunt man jumps onto a large air bag, the change in momentum as he stops is achieved over a greater amount of time giving a smaller force. In the video below the car has a crumple zone at the front to increase the chances of surviving a crash. 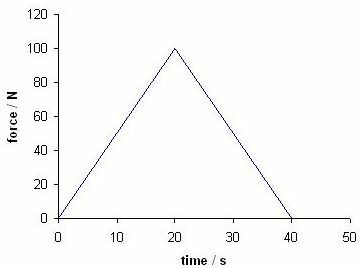 The area under a force – time graph gives us the impulse of the force applied (and hence the change in momentum of the object). For this graph the impulse (the area under the graph) is 2000 kg ms-1. The principle of conservation of momentum when two objects interact the total momentum remains the same provided no external forces are acting. Example; A toy car of mass 8 kg is travelling at 20 ms-1. It collides with a car of mass 3 kg which is stationary. The two cars join together and move of as one object, what is the velocity of the two cars as they move off together? Example; Two objects are stationary and in contact with each other. They are pushed apart by an explosion. The 3 kg toy car moves right with a velocity of 14 ms-1 and the 8 kg car moves left. What is the velocity of the 8 kg toy car as it moves left? In the video below the bullet from the gun goes forward and the rifle travels backwards (recoil) so momentum is conserved. Elastic collisions are those in which kinetic energy is conserved. You have the same total mount of kinetic energy at the start and end of the collision. Inelastic collisions are when you do not have the same amount of kinetic energy at the end as you had at the start. Some of the kinetic energy has been dissipated to the surroundings.